So for the past two Fridays a food truck by the name of No Tomatoes made a stop at my office for lunch. 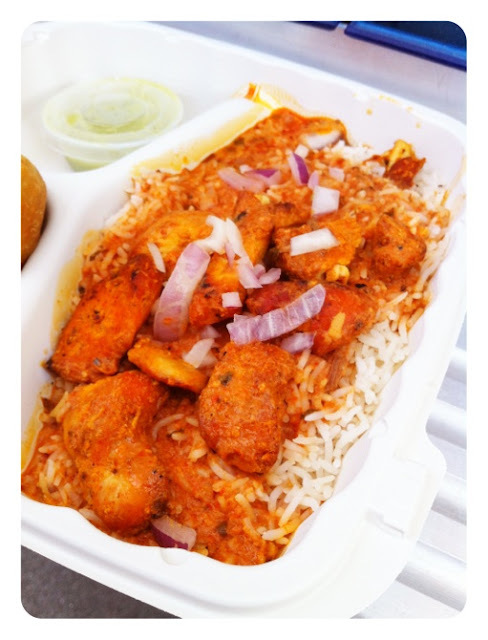 The No Tomatoes truck is an Indian Food truck that got it's name for the way the owners usually order their food...with no tomatoes! Pretty clever huh? 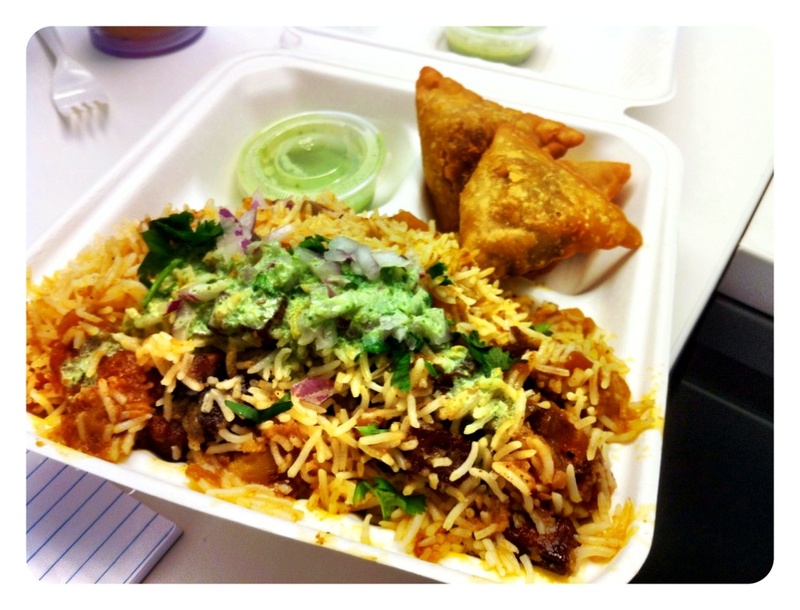 Anywho, they had a really good combo for $9, an entree, 3 samosas and a drink. 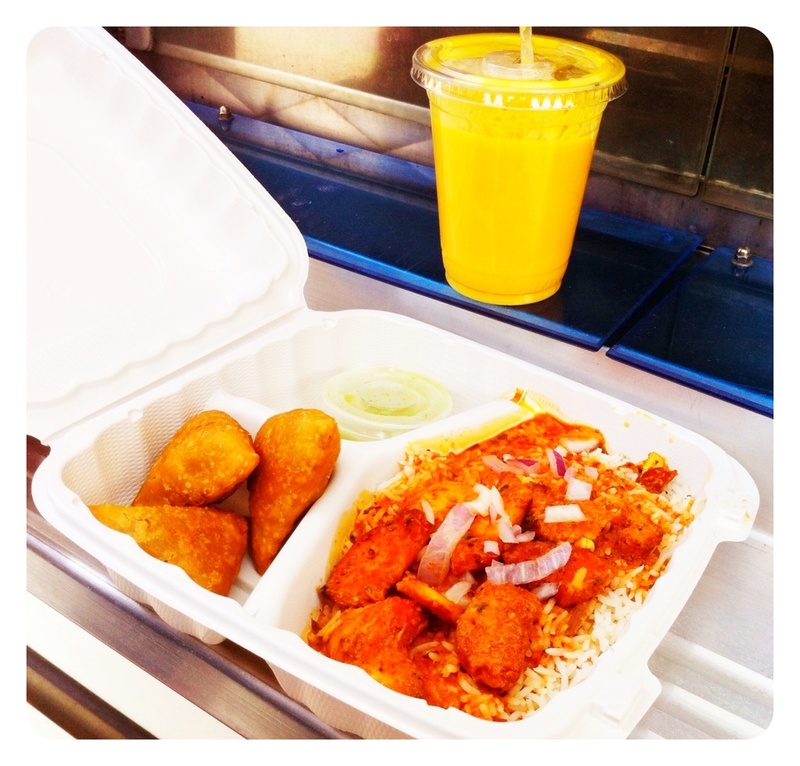 The first week the truck came I ordered what I always get at Indian restaurants, Chicken Tikka Masala. The aroma coming from the tikka masala was indeed mouth-watering so I was excited to take that first bite...and I was really disappointed in how dry the chicken was. The tomato based sauce (this was the only dish on the menu that was made with tomatoes) was spicy, not overly hot but contained a slow heat that started in the back of mouth and slowly creeped forward. Aside from the heat it was buttery and smooth, very complementary to the rice. The bite of the chopped red onion added crunch and bite to the dish. The Samosas were filled with spinach and paneer (a type of Indian cheese). These little triangular puff pastries were insanely delish. They were a good size, especially for having three to an order. The samosas were perfectly golden brown, not greasy, flaky, buttery, and were absolutely stuffed with the filling. The order included a mint chutney that was minty yet packed some heat...it wasn't overly minty but was a nice sauce for the samosas. Mango Lassi's are drinks made up of mango pulp, water and yogurt. It's thick like a smoothie, sweet and a much needed drink when you're chowing on some spicy Indian food. The second week they showed up I decided not to go for a chicken dish but instead ordered the vegetarian Biryani Rice. I also got the mixed Samoas this time around. The Vegetarian Biryani Rice had paneer and potatoes instead of meat. The rice itself is a saffron based rice, a flavor that is easy to identify right off the bat if you've been lucky enough to have it before. For those of you who don't know saffron is a crazy expensive spice that's used in Turkish, Persian, South and Central Asian, and many other countries. It adds a distinctive yellow-orange hue to dishes. This dish was a texture explosion. The paneer was grilled so it was chewy and soft, not as soft as cooked tofu but something along the lines of a firm tofu without the crumble. The potatoes were soft but weren't overly soft so they fell apart in the dish, they held their shape. The rice was fluffy and packed with flavor and the red onion added bite and crunch. The mint chutney once again added a nice heat and light minty flavor. Overall, I really enjoyed my experiences at this truck. It can be hard to find really good Indian food and what could be better than having authentic Indian cuisine on wheels that comes to you?! I recommend you follow them on twitter so you can taste these dishes for yourself.